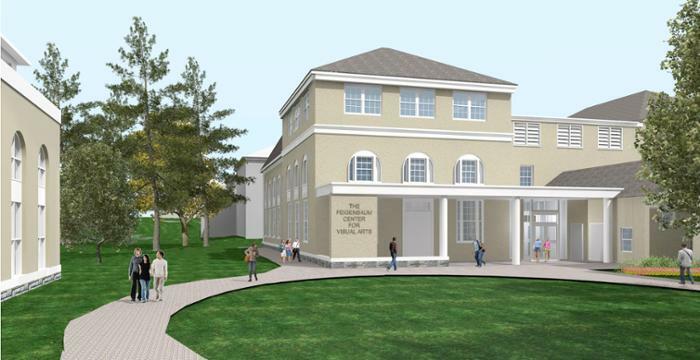 An $11 million gift from the Feigenbaum Foundation will help support a major renovation of the Visual Arts building, provide a four-year, need-based scholarship to a Berkshire County student annually, endow a professorship and establish an annual forum on innovation and creativity, Union officials announced today. The foundation was created by brothers Armand V. Feigenbaum ’42 and Donald S. Feigenbaum ‘46, longtime benefactors to Union. Acknowledged world leaders in systems engineering and total quality control, the brothers founded General Systems Co., the Pittsfield, Mass.-based international systems engineering firm that designs and helps implement operational systems for corporations and governments worldwide. Armand died last November; Donald, March 2013. The foundation will provide the lead gift that will allow the College to transform the Visual Arts building, completing a vibrant arts corridor designed to inspire collaboration and interdisciplinary energy that embodies the spirit and values of the Feigenbaums. In recognition of the gift, the building will be renamed the Feigenbaum Center for Visual Arts. The foundation supports institutions with an emphasis on education, science, technology and management, primarily in the Berkshires area. Built in 1852 to house the departments of physics and chemistry, the building formed part of the original campus plan, a comprehensive design for Union’s campus by French architect Joseph Ramée that became a model for collegiate planning. It is home to art history and studio arts programs (drawing, painting, printmaking, photography, sculpture and digital art). Highlights of the renovation include a three-story addition featuring a sculpture and design studio for metalworking alongside an outdoor sculpture space; an expansion of a public gallery to accommodate larger exhibitions; improvements to the photography area; a drawing/2D design studio; a 3D design studio; a media lab; and a suite of working artists’ studios for visual arts majors in all media to make and display their work. The project also includes extensive improvements to the heating, ventilation and air conditioning systems that will be more environmentally friendly and energy efficient. Joining the Taylor Music Center, the Yulman Theater and the recently opened Henle Dance Pavilion, the Feigenbaum Center for Visual Arts reaffirms the importance of the arts to an integrated education and will attract not only students interested in the arts, but future engineers, physicists and chemists. Construction is scheduled to begin this summer; the building will reopen for the fall 2016 term. • Endow the Feigenbaum Professor of Behavorial Economics. This new faculty position will teach about and study the effects of psychological, social, cognitive and emotional factors on economic decisions of individuals and organizations. • Provide a four-year, need-based scholarship to a Berkshire County student annually. • Establish the Feigenbaum Forum on Innovation and Creativity. For more than a dozen years, Donald and Armand hosted the Feigenbaum Forum, a gathering at Union at which academicians discussed characteristics of a new generation of leaders and how better to integrate liberal arts and other studies. The new program would build on this event by bringing in nationally and internationally ranked speakers who have revolutionized their fields of endeavor through contributions deemed innovative and creative. Armand graduated from Union with a B.A. in industrial administration, and earned a M.A. and a Ph.D. from the Sloan School of Management at MIT. Donald received a B.S. in electrical engineering. They maintained a deep connection with the school, often remarking on how their years at Union influenced them, shaped them and prepared them for the future. Former engineers at General Electric Co., the brothers founded General Systems in 1968. Their approach to quality and profitability profoundly influenced business management strategy at some of the world’s largest corporations for more than five decades. They authored a number of books that were highly influential in the industry. Total Quality Control, published in 1952, has been reprinted numerous times in dozens of languages. “Their advice is pragmatic, and it saves companies big bucks,” Business Week stated. Union’s administration building, where their portraits hang in the first-floor lobby, was dedicated in their honor in 1996. Armand received an honorary doctor of science degree from the College in 1992 and the Alumni Gold Medal in 2012. The College celebrated Donald’s achievements with an honorary doctorate in 1996 and the Outstanding Engineering Alumnus award in 2003. In 2008, Armand received the National Medal of Technology and Innovation, the nation’s highest honor for technological achievement, from President George W. Bush in a White House ceremony. “We are delighted to be able to bring to fruition this gift that Armand and Donald had been considering but were unable to complete,” said Emil J. George, president of the Feigenbaum Foundation. PITTSFIELD — Thanks to two of the county’s most generous benefactors, the Berkshire Theatre Group has obtained a significant endowment that will provide the organization with financial stability. BTG, which operates the Colonial Theatre in Pittsfield and the Berkshire Theatre Festival in Stockbridge, has received a 10-year, $5 million endowment pledged by the Feigenbaum Foundation, an organization founded by brothers Armand and the late Donald Feigenbaum of Pittsfield. BTG President Ruth Blodgett said the funds “will help sustain [the theater] and its artistic, economic and educational impact on future generations,” during a celebration at the Colonial on Friday. “We are humbled by this honor and it strengthens our resolve to build upon this mission for our community,” Blodgett said. The Feigenbaums, who established the global company General Services Corp. in Pittsfield, have donated millions to Berkshire County-based institutions through their foundation, which they established in 1988. They include the Berkshire Museum and the Massachusetts College of Liberal Arts. Donald Feigenbaum died in March 2013. BTG Artistic Director and CEO Kate Maguire said the organization will receive the funding from the Feigenbaum Foundation in annual $500,000 increments over the next decade. But BTG won’t be able to access the interest or principal from any of that funding until it reaches the $5 million mark, said Feigenbaum Foundation President Emil J. George. “It helps the theater in that it provides a future of stability,” Maguire said during an interview in her office at the Colonial on Thursday. BTG officially announced the acceptance of the endowment at the theater on Friday afternoon, in which stars bearing Donald and Armand Feigenbaum’s names in the Colonial’s main walkway were officially unveiled. Maguire said BTG is planning to launch a major fundraising effort to both build on the endowment and expand the performing arts and educational capabilities of the organization’s five stages. “What I’m working on with the board is mounting a challenge campaign,” Maguire said, “and asking the community to join the Feigenbaums in enriching our operations. George referred to the foundation’s pledge as a method to “jump-start” the BTG’s endowment. “It’s not a panacea,” he said. During the event at the Colonial, George said he and the late Bernard “Bud” Riley hammered out the structure of the arrangement last summer shortly before Riley’s death. The endowment is not specified for a specific purpose. Maguire said it will be used to create the Feigenbaum Center for the Arts at the Colonial Theatre, which will expand the organization’s work in creative arts programming. Those initiatives include school trips to the BTG’s five performing arts spaces, and programs that reinforce classroom curriculum and community productions that allow adults and children in the Berkshires to share their talent and creativity. BTG plans to erect a concrete sign with the words, “The Feigenbaum Center” which will be placed over the glass doors on the brick building that serves as the Colonial’s main entrance on South Street. The sign should be in place within the next month, Maguire said. 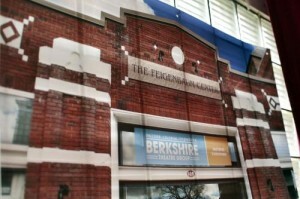 The BTG was formed in June 2011 when the Colonial Theatre officially merged with the 86-year-old Berkshire Theatre Festival. The 111-year-old Colonial, which reopened in 2006 following a $21.6 million renovation, had experienced net income losses in two consecutive years of filings with the federal Internal Revenue Service before the merger occurred. “The Colonial is one of the most important institutions in Pittsfield,” George said. “It really changed the game and made Pittsfield a major player in the Berkshire County arts scene at a time when Pittsfield was reeling from the loss of its major employer. NORTH ADAMS, Mass. — Massachusetts College of Liberal Arts President Mary Grant announced a “transformational gift” of $5 million from Feigenbaum Foundation to an ecstatic crowd that packed the science center’s lobby on Friday afternoon. “With support from the Feigenbaum Foundation we will support excellence in learning and teaching at MCLA, the advancement of research on innovation and leadership at the college amd throughout the Berkshires that the Feigenbaums held so dear,” Grant said. Patrick described the center as a “gorgeous building” that he hoped he could tour when there weren’t quite so many people around. Constrasting the opening as a step forward for the state, even as the federal government is stalled, he said the center was “important for North Adams, for Berkshire County, for Western Massachusetts, for the whole region, and the whole commonwealth. Department of Higher Education Commissioner Richard Freeland said the building shows a strong commitment to the state’s youth. “I don’t think [you light] a fire more among a young person than adults saying, ‘You matter, you’re important, your work matters and we’re willing to put money on the table.’ That’s what this building says to this community and the young people who come here and the people who teach and work here,” Freeland said, speaking with Carole Cornelison, commissioner of the Division of Capital Asset Management and Maintenance. “When we moved into this building, it was really like moving home,” Billetz said, also noting how the science departments were involved in the process and were able to provide input along the way. “My peers and I have the opportunity to enhance our learning both in and out of the classroom because of the resources available to us in this building,” Andrews said. The county’s delegation had strong attendence, with Rep. Gailanne Cariddi, D-North Adams, Rep. Tricia Farley-Bouvier, D-Pittsfield, and Rep. William “Smitty” Pignatelli, D-Lenox, on hand. In addition, Sen. Benjamin Downing attended. Grant also thanked past representatives and school officials who had made the project possible, particularly former state Rep. Daniel E. Bosley. The county’s two mayors also attended. Mayor Richard Alcombright and Pittsfield Mayor Daniel Bianchi stressed the importance of the center as a regional asset to science education. “As a significant part of [Mary Grant’s] efforts, she was passionate that this place does not only provide a state-of-the-art learning environment for her students, but also a facility that would become a regional STEM resource center for the community and for our K-7 educators and our students,” Alcombright said. The $40 million building was funded through $54.5 million in capital funds from the governor’s 2008 Higher Education Bond Bill and $1.7 million from MCLA; the college next looks to use those funds to begin renovations of Bowman Hall. The center’s groundbreaking took place on a similarly drizzly Friday two years ago and was opened to students at the beginning of this semester. PITTSFIELD — Armand Feigenbaum and his late brother Donald have made a pair of $1 million donations to Temple Anshe Amunim that will help provide financial compensation for the temple’s head rabbi and allow a popular lecture series to continue in perpetuity. They are the largest single donations to Temple Anshe Amunim in the congregation’s 144-year history, according to temple president Howard Shapiro. Anshe Amunim is the fourth oldest reform congregation in the Northeast. The founders of the global firm General Systems Company Inc., Donald Feigenbaum, who died at age 87 on March 5, and his older brother, Armand, grew up in Pittsfield as members of Anshe Amunim’s congregation, Shapiro said. Their mother was also a member of the temple. The Feigenbaum Foundation established the Hilda Vallin Feigenbaum Lecture Series, now in its 46th year, in her memory to bring programs of outstanding cultural significance to the Berkshires. Speakers have included such luminaries as author Isaac Bashevis Singer (1975), politicians Barney Frank (1996) and Julian Bond (2000), and journalists Sander Vanocur (1991) and Bernard Kalb (2002). This year’s lecture is scheduled for Sept. 29. The second donation establishes the Dr. Armand V. and Dr. Donald S. Feigenbaum Rabbinic Chair Endowment. Established by the temple’s board of trustees to honor and recognize the Feigenbaums, the funding will be restricted to contributing to the financial compensation of the temple’s head rabbi. Shapiro said the temple had discussed the concept of endowing a rabbinic chair with the Feigenbaums, but the decision to establish that endowment was made shortly before Donald died. “These gifts will be of great importance in securing the financial foundation of our congregation,” said temple treasurer Andy Hochberg, who also co-chairs the lecture series, in a statement. General Systems Company is a global leader in the design and installation of proprietary quality management operating systems that accelerate the competitive business strengths of manufacturing and service companies. The Feigenbaums founded the company in Pittsfield in 1968.